The approach of Labor Day gives us one last chance to enjoy this wonderful summer. I am looking forward to some time away this weekend, visiting my mother, and I hope you all have a wonderful and safe Labor Day weekend. 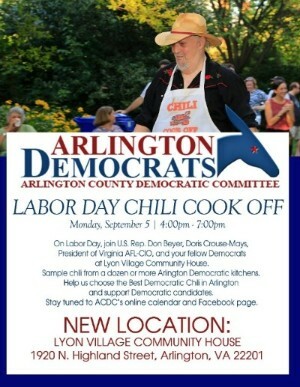 Labor Day also marks the unofficial start of the fall campaign, and the annual Arlington Democrats’ chili cook-off. I’ll be bringing my chili, and there will be many more from candidates, officials, and activists across the county. The cook-off will be Monday from 4-7 pm at the Lyon Village Community House, 1920 N Highland Street, corner Lee Highway. Admission is $40, and you can pay online or at the door. You also can save on admission by purchasing an Arlington Democratic Gold Card, which costs $200 if you purchase by Monday (less for ACDC Roosevelt Society or Arlington Young Democrats members; prices go up starting Tuesday). Buying a Gold Card is an easy way to contribute to the whole Democratic effort in Arlington while having fun because it is your ticket to the chili cook-off and to two more events throughout the fall.